WooCommerce TrustCommerce gateway plugin download and view documentation here. Tokenization - This gateway tokenizes payment methods in a way that allows Autoship Cloud to create and pay for recurring orders automatically. In TrustCommerce, this feature is known as the "TC Citadel"
Authorize Only - This type of transaction is supported for Autoship Cloud. Once you have installed and activated the TrustCommerce gateway plugin, you will need to enter your TrustCommerce account credentials to setup and configure the plugin settings before you can start using it. To do this, navigate (in your WP Admin) to Woocommerce > Settings > Checkout > TrustCommerce (either at the top of the page where all the plugins are listed as text, or at the bottom where the enabled/disabled gateways are displayed). Once there, you will need to ensure that "Tokenization" is enabled by enabling the setting "Save Customers to TC Citadel®:"
Notes: The field labeled "Enable TrustCommerce Test Mode" should only be used if your TrustCommerce Account is set to use the "Sandbox Environment". You will need to supply the username and password from your TrustCommerce account that corresponds with the environment in which you will be using the gateway. Once your configurations have been set, click "Save changes", and complete a checkout from your store to ensure that your WooCommerce checkout is working as expected. Once you have ensured that the payment gateway can successfully process a checkout and save a payment method in your store, you'll need to create a payment integration inside of Autoship Cloud. 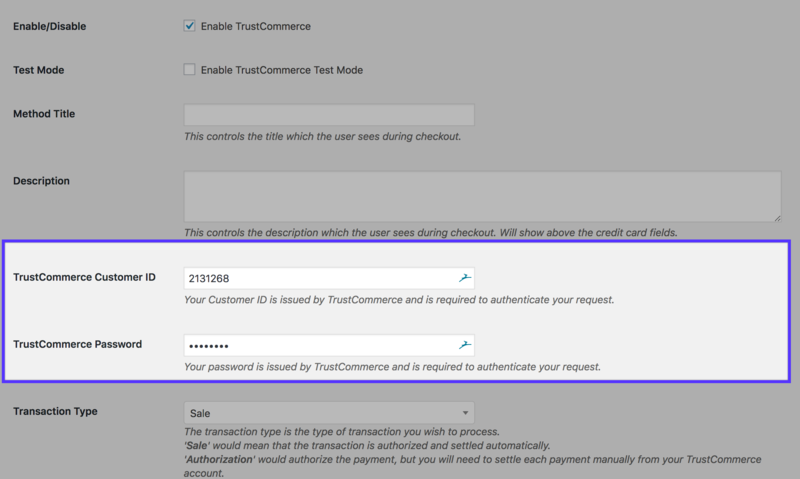 Select "Trust Commmerce" and enter your username and password (the same that were entered into your WooCommerce Payment Settings). Double-check to ensure that the username and password you are entering are specific to either your TEST or LIVE environment. When you're done, click "CREATE". 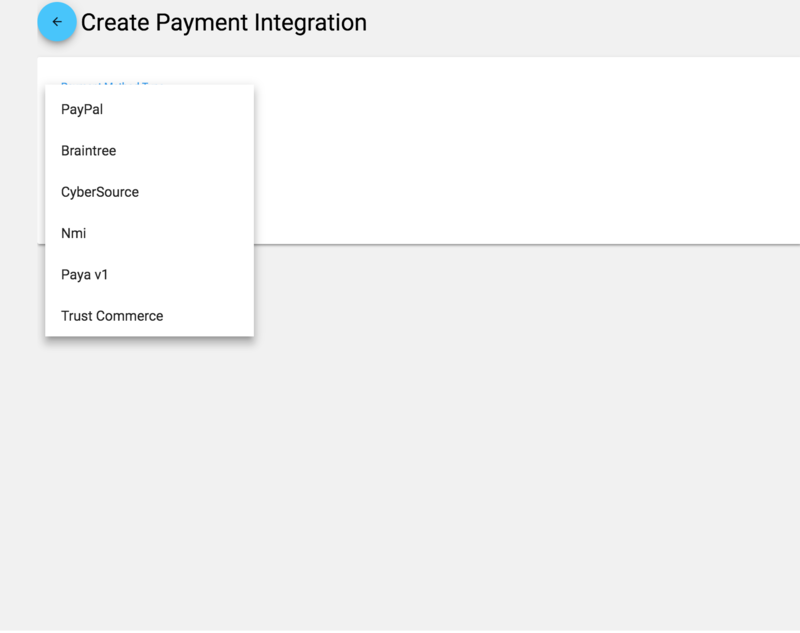 You should now see a new payment integration in your Payment Integrations list. You are now ready to test Checkout and Scheduled Orders with Autoship Cloud. 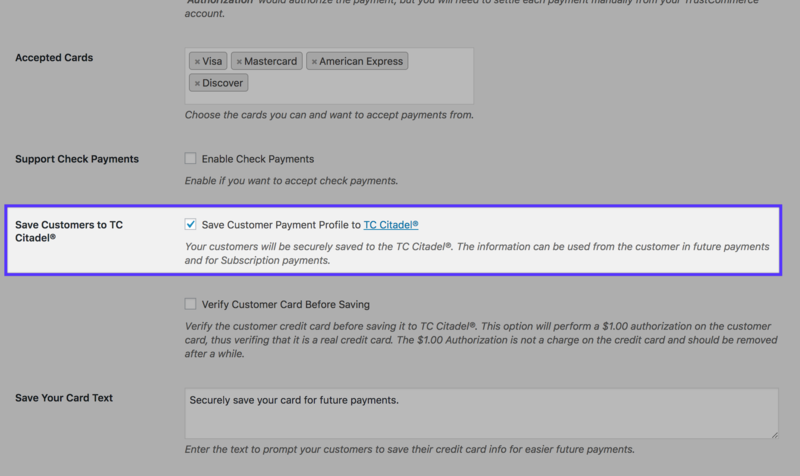 Payment methods saved with TrustCommerce TC Citadel use one unique payment ID to reference a saved payment method that belongs to the customer. When a saved payment method is created via WooCommerce Checkout or within My Account, this unique ID is applied in the GatewayCustomerId field of payment methods on Scheduled Orders for recurring billing. Along with other billing fields, like Name and Address, the GatewayCustomerId can be used to add new payment methods when Editing Scheduled Orders.